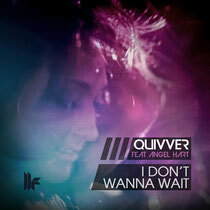 Toolroom Records recently released their latest big track, Quivver Feat Angel Hart ‘I Don’t Wanna Wait’, with remixes by Ben Delay, David Penn and Pammin, with and a video shot in Miami. Quivver, who has gained support for his various club releases from A-list DJs such as Sasha, Pete Tong, Paul Oakenfold and John Digweed, has also garnered a loyal fanbase through his productions and continues to deliver lots of top productions. Now, after months of promo heat, ‘I Don’t Wanna Wait’ gets it release and features delicate layers of percussion alongside luscious piano chords and enchanting vocals from Angel Hart. Ben Delay delivers a deeper but electro-inspired remix, pumping up the synth melody without distracting from the piano and vocals. House veteran David Penn provides the techier and more underground take on the original, bringing the percussion to the fore with pitched-down vocals and a rawness set for the clubs. Finally, Berlin’s Pammin turns in a deep and euphoric remix, with lovely chords and a gentle guitar lick. Check out its video and have a listen below.